When I moved out of the Eaux-Vives neighborhood, I lost my favorite pizza joint and friends (see my post about Chez Marino). Settling into a new neighborhood means finding new habits and new hangout spots, and I have been on a quest to find my new favorite coffee shop (see my posts about Le Fix and Viverra Coffee). Once the last cardboard box was unpacked, it was time to find my new pizza joint. God answered my prayers and gave me two pizza joints really close to my apartment. I go to La Rotonde located on Rue des Paquis 15 for their pizza to-go at 15 CHF on a lazy weekday. I really enjoy their eggplant pizza, and it is a great value for the price. I go to Espresso Club when I want more of a sit-down experience. I love the fact that there are no tables, everyone sits at the round bar and looks at the circus: the waiter is running around refilling everyone’s drinks, the pizzaiolo is busy making pizzas as fast as humanly possible. The place is loud and small, people are drinking, smiling, talking with their hands, and watching soccer on TV — for a moment you could think you are in a small trattoria in Napoli. Waiters are friendly and it seems that they know all their customers by name. 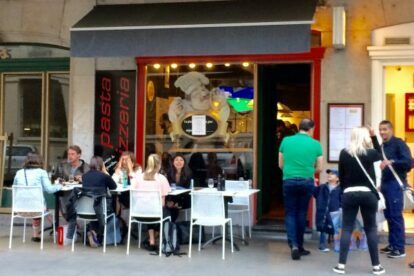 This pizza and pasta joint has a flock of regulars and friends, which creates a nice family atmosphere. Downsides: no wood oven pizzas and cash only.